Irrigation pipe products are evolving to make systems more efficient and installations quicker and easier. When it comes to irrigation pipe, contractors have strong opinions. But despite their personal preferences, experts agree that contractors should be open to different varieties and new products and should consider soil type, environmental temperatures, water pressures, elevation changes and other project factors before choosing one or the other to ensure the system runs as efficiently as possible. Polyvinyl chloride (PVC) and polyethylene are the two most common types of pipe used for traditional irrigation systems. While irrigation experts recognize that both types of pipes work, there are some notable differences. 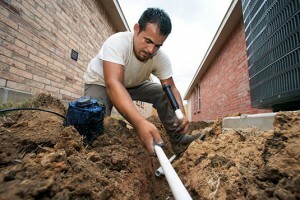 PVC is available in 20-foot lengths of rigid pipe that needs to be connected by a coupler or fitting. Polyethylene typically comes in 100- to 300-foot coils, so a much longer length of pipe can be installed before a fitting is required. It also can be easier to transport, as the coils fit in any truck bed. Because of its rigidity, PVC pipe is known to crack and shatter in freezing temperatures, but the pipe has a higher burst pressure. Polyethylene is made of a softer plastic that is more flexible in extreme cold and is also more effective in sandy soils. The type of pipe used generally varies region to region but often comes down to a contractor’s personal preference. Jess Stryker, a retired landscape architect and owner of Jess Stryker & Associates in Ventura, Calif., agrees. He says he always used PVC pipe primarily because it’s what is most commonly used on the West Coast. 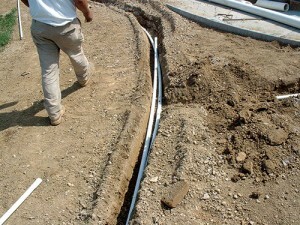 PVC irrigation pipe has been used historically on the West Coast. Contractors may be prompted to change their ways, as products evolve, systems become more efficient and installations become easier. In PVC pipe, there has been an ongoing trend toward the use of reclaimed water pipe, commonly known in the industry as purple pipe. It’s driven by a growing emphasis on water conservation and reuse, particularly in areas where water is a limited resource. High-density polyethylene, or HDPE, is another emerging trend, particularly in commercial landscape and golf course applications. It comes in pipes measuring 2 inches wide and larger, has thicker walls and is made of denser material. Also, HDPE pipe doesn’t require fittings. It’s heated up and welded together. Knowles says this difference makes HDPE ideal for irrigation system main lines because it reduces the risk of breaks or cracks. Polyethylene pipe is popular in the North and East due to its flexibility in cold temperatures. The introduction of 4710 resin in the production of HDPE began about three years ago, and has since become industry standard, replacing the 3408 and 3608 resin products used in the past. This change has allowed the pipe’s pressure requirement to be met using less material, providing a production advantage to the manufacturer. As the dimensions of the pipe are reduced, the pipe becomes more flexible and easier for contractors to install. These changes also provide advantages in coiling, which reduce shipping costs for distributors. Cross-linked polyethylene, or PEX, pipe is another product making its way into the irrigation industry. PEX is made of HDPE, but cross-linked bonds in the structure of the polymers make it stronger. It has a higher burst pressure, which is great for high-pressure mainlines, Stryker says, and PEX can withstand freezing temperatures so it can be used in any environment. “I expect we will see more irrigation systems everywhere using flexible piping systems with PEX for mainlines and poly for laterals,” Stryker says. When it comes to fittings, “Push-to-connect” fittings are gaining popularity. They’re quick and easy to install, saving contractors time and money. The tube is simply pushed into the fitting, eliminating the need for soldering, clamps, glue and even tools. An O-ring is used for sealing, and a grip ring holds the tube in place. These fittings are available for polyethylene and PVC pipes, and they also work with PEX.